The Staten Island (AGB-5) was built in the U.S. and handed over to Russia under an agreement for assistance in 1944 being called "Severny Veter (Wind of North)". Returned to American hands in late 1951 under the name of Northwind, but to avoid confusion with another coastguard vessel of the same name, to join the Atlantic fleet it was renamed as Staten Island. During many of these expeditions where also conducted scientific experiments in these high latitudes, including geophysical surveys and cosmic radiation studies. In this context, the Staten Island was used as a launching base for the so called "Rockoons" balloons carrying up to the stratosphere rockets that once there, were launched into space. This occurred twice in the history of the ship. The first launches took place during a cruise in 1953 between Boston, Massachusetts and Thule, Greenland, from the middle of July to the middle of August. 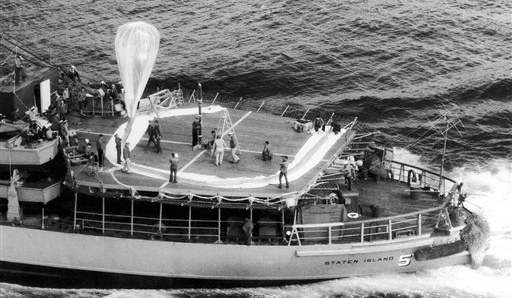 A total of 14 balloons were launched in that opportunity, ten of them under an operation called "Mushrat" coordinated by the Iowa State University to study cosmic radiation, and the other four under the aegis of a program of the Naval Research Laboratory to measure physical properties of the upper atmosphere. The second series was carried out two years later between late September and early October 1955, with a total of 26 more balloons launched, more or less in the same zone of the north Atlantic Ocean and with similar objectives. Three years later in 1958, a third campaign took place involving balloons. This time was a complex experiment that involved the almost simultaneous launch of balloons from the Staten Island and Invercargill, New Zealand, carrying identic equipment (cosmic ray detectors) to investigate the electron precipitation from the magnetosphere in the so called "conjugate zones". Subsequently, the vessel participated in the operation "Deep Freeze II" in Antarctica (collaborating on the construction of the scientific station Ellsworth) and other arctic missions until it was transferred back to the coastguard service in early 1966. In November 1974, it was decomissioned and finally sold for scrapping.